What if the audience doesn’t like my speech? What do I do if I get on stage and my mind completely blanks because I’m so nervous? What if I look super awkward on stage? Nearly 30 percent of Americans report that they’re “afraid or very afraid” of public speaking. In fact, this fear is so widely accepted that many scientists researching stress actually will induce anxiety by asking study participants to give a speech. Most fears about public speaking stem from our fear of being judged. We are so scared of being criticized that we forget we have the power to share a message. I want to teach you how to captivate an audience so you can conquer your public speaking fears and get your message across. 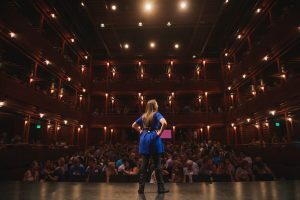 Let’s dive into the research-backed public speaking tips, so you have the confidence to get on stage and master your stage presence. Use Metaphors, Similes, and Analogies. Metaphors are like mini-stories. You tie something that someone understands to a new idea or concept. I LOVE metaphors—I think they are the most powerful way to get ideas across. For example, I teach people how to read micro-expressions and liken the ability to decode the face to watching life in High Definition TV. All of a sudden you see things that you didn’t notice before. In other words, I turn the skill of decoding facial expressions into a metaphor with the connection to HDTV. Let me tell you, whenever I use this metaphor with live audiences, people either audibly will say, “oh” or “ah” or nod their head yes, as if it clicked for them. That’s the power of a good metaphor. 3-Part Lists. Whenever you’re speaking in public, you have to keep in mind your audience’s capacity for remembering information. Breaking down your message and actionable takeaways into three parts makes it easy for people to understand, remember and act on your goals. If you can organize your speech into three main ideas, even if it is an impromptu message in front of the team, it will help people remember what you have to say. Rhetorical Questions. A rhetorical question is a question you ask of the audience for dramatic effect or to make a point instead of expecting a response. Something like, “Do you know how this tip can work for you?” or “How many of you have felt like the man in the story?” You don’t need people actually to raise their hands (although they might). The reason these are so powerful is because any kind of question engages people mentally; we are programmed to respond to questions, even if it is just internally. Speak Powerfully. It’s not just what you say, it’s how you say it. Be sure that whatever verbal tactics you are using, you are doing it with power. Here are my favorite vocal power tactics. How do you go from being a merely influential speaker to an inspirational one? The answer lies in one simple, but extremely universal, speech theory. Start by explaining “what is.” This is the problem, the process, the level of achievement, etc. that you want to change. Then explain “what could be.” This is your goal for a better future. The best speakers paint the picture of the best possible future that their message can provide. In other words, if every audience member uses your tips and solutions, what will their life look like? What will their day look like? What will change for them? I use this when I’m speaking about body language. I might start by talking about the miscommunication issues that people struggle with and then explain how learning body language allows you to communicate more effectively. I’ll repeat this throughout my speech by noting specific things that people struggle with, followed by body language tactics that solve each of those problems. When you’ve explained all of your points, end your speech by creating a clear vision of what the audience can expect if they follow your advice, invest in your company, implement your plan–whatever you tried to persuade them to do. Watch Nancy Duarte’s TEdxEast talk to learn more about her speech theory and what you can do to become inspirational. A big mistake nervous speakers make is apologizing or couching their ideas. When we are feeling nervous, we say things such as ‘It’s just my opinion,’ or ‘I’m not really sure,’ or ‘I could be wrong, but.’ This is detrimental to your message! First, be sure to research all of your points so you feel confident about the information you are sharing. Second, once you are sure of your content, practice your speech in front of friends. Every time a qualifier or caveat is added, friends should gently point it out and have you start over. The best speakers also know that not everyone is going to like them. In fact, some of the best speakers are controversial, and that’s a good thing! You want people to get riled up, get thinking and feel emotion. That means you are striking a chord! Don’t self-block. When we get nervous, we tend to try minimizing the amount of space our body takes up. We also subconsciously try to barricade our body from the audience with crossed arms or a podium. I recommend holding a clicker or microphone. This might seem counterintuitive, but it forces you to uncross your arms and makes putting your hands in your pockets more difficult. Carry one bag. 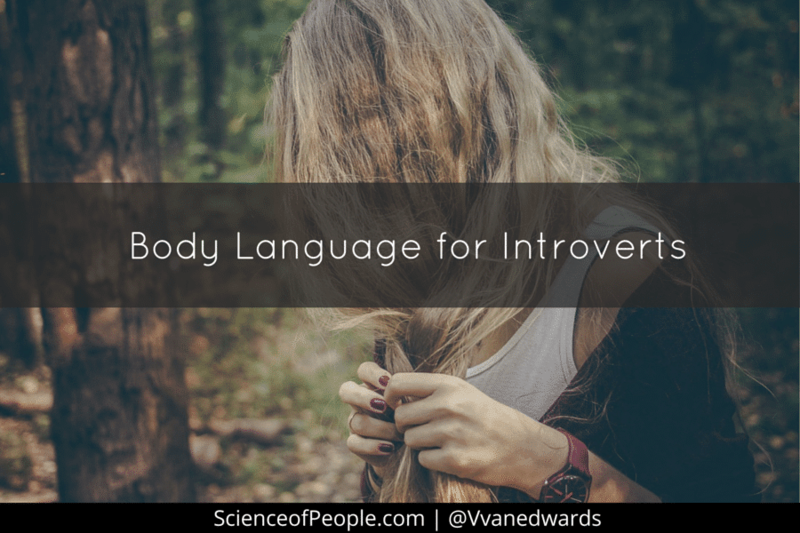 Nonverbal communication goes beyond the body into colors we wear, clothes and accessories. 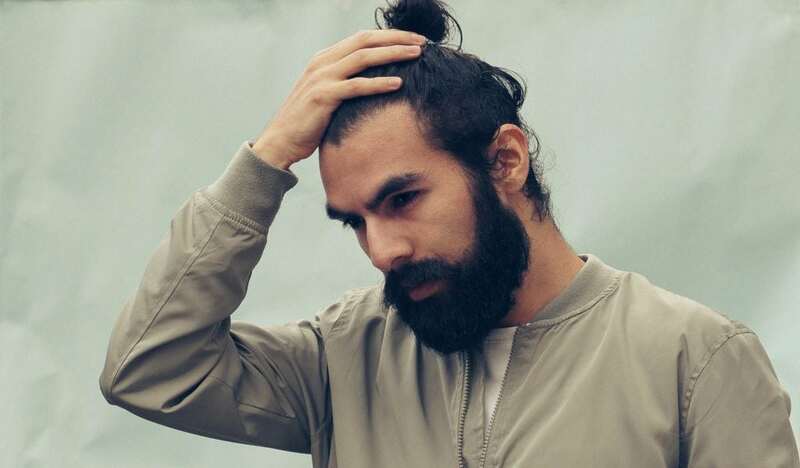 One set of research has found that people who carry more than one thing–such as a purse and a briefcase or a briefcase and a coat are perceived to be less organized and more forgetful. Before going into a meeting or event, be sure to consolidate your bags, leave coats and extra things in the car or give your coat to the receptionist to hang up so you do not have to carry it in with you. Avoid self-touch. 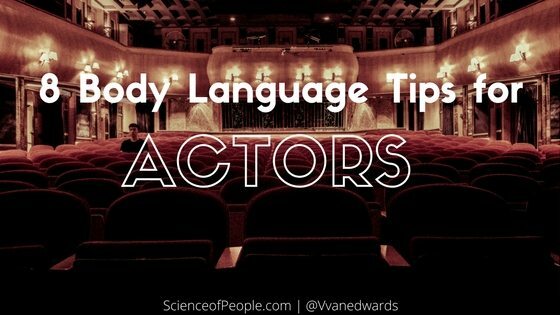 You want to avoid a few nervous body language cues when speaking. The most common nervous body language cues are self-touch gestures. Specifically, you want to avoid wringing your hands, cracking your knuckles, touching your face or hair or biting your lips. If you need to hold a clicker, that can anchor your hands. Academic researchers hypothesize that this intense fear of public speaking comes from evolution. In the past, when humans were threatened by large predators, living as a group was a basic survival skill, and ostracism or separation of any kind certainly would mean death. This may have evolved into the fear of public speaking — and it makes sense. What situation embodies that kind of separation more than standing all alone in front of a room full of people? On a deep level, people are afraid their audience will reject them. Another theory states that when we enter a state of social anxiety, which is common in public speaking, our ability to pick up on angry faces is heightened. In a 2009 study, psychologist Matthias Wieser measured participants’ brain responses to angry, happy and neutral images. In order to elicit anxiety, Wieser told some of the participants they would have to give a speech. The anxious participants were significantly more sensitive to the angry images than to happy or neutral ones, but the rest of the participants did not exhibit the same bias. It’s easy to see how this phenomenon becomes something of a vicious cycle in the context of public speaking. When we start out nervous, no matter how many people are smiling or nodding along, we’re apt to lock onto the one person who looks angry, which makes us even more nervous. Our friends at Quantified Communications used their software analyzer to compare patterns of the best speakers. They found that the most confident speakers demonstrate 22.6 percent more passion than nervous speakers, meaning their delivery exhibits the kind of energy and engagement that indicates they’re really invested in their topic. If you’re nervous about an upcoming speech, channel that nervous energy into demonstrating your passion for the topic at hand as you share your best insights with your audience. Nervousness and excitement are two sister emotions. When you feel your heart race, reframe that as excitement. Use hand gestures! One way to calm nervous hands is to give them purposeful movement. Here are my 20 favorite hand gestures for speakers and how you can use them. This will help you channel your nerves into excited and passionate gestures. Beat performance anxiety. If you have really severe anxiety, try my 7 steps to beat performance anxiety. This is a more systematic approach you can take to battle those nerves. Do you have stage presence? I have created a formula to learn how to work a stage like a pro and win the crowd. My big idea: Don’t pace, purposefully move. When we have adrenaline pumping through our bodies, we tend to pace the stage. It is a way of moving all of our nerves out of our bodies. Many speakers do this subconsciously and often have no idea the audience is being forced to watch them like a ball in a tennis match. Want to truly master your people skills? We offer an advanced online training for those looking to truly accelerate their learning. Learn more about People School. Another finding from Quantified Communication was around the audience. 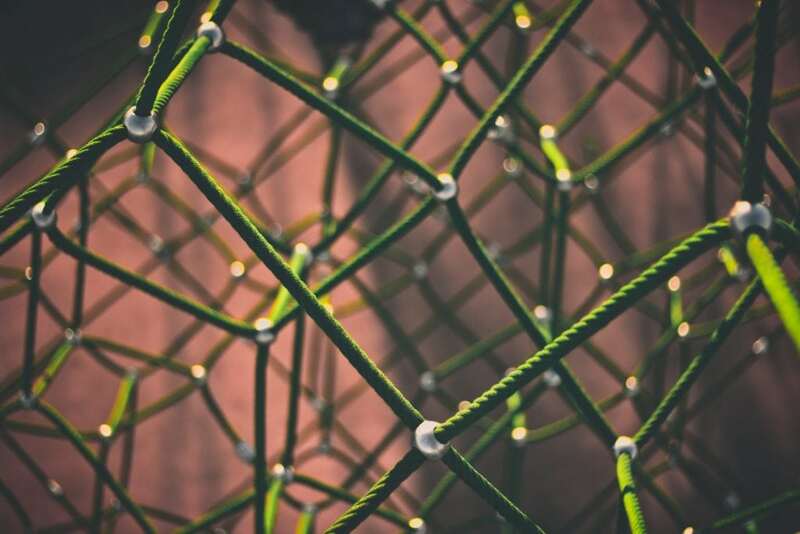 They discovered that the most confident speakers use 46.9 percent more inclusive language than nervous speakers, meaning they’re using collaborative words and personal pronouns to help the audience feel more involved in the message. This finding could indicate that the most confident speakers are community-oriented, and suggests that camaraderie-driven language can help nervous speakers build confidence by overcoming that evolutionary fear of ostracism. Don’t speak at the audience, speak to the audience. Thinking credible means being unemotional. Many speakers who are trying to come across as professional and serious think they have to deliver direct, emotionless speeches. This is the problem with most of the least popular TED Talks. They are interesting, well-presented speeches that are stiff and boring! Having emotions, caring about your work and fusing energy into your talk does NOT make you less professional. It makes your professional message more palatable. Emotions are the condiments of speeches. 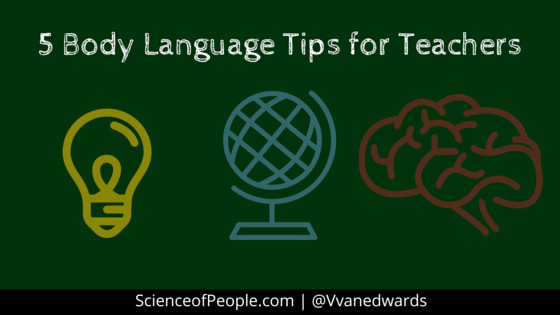 Emotions add spice, flavor and personality to your talk, your stories and your ideas. Here are the most common emotions speakers can add to their talks. Do you have any stories that can embody these emotions? 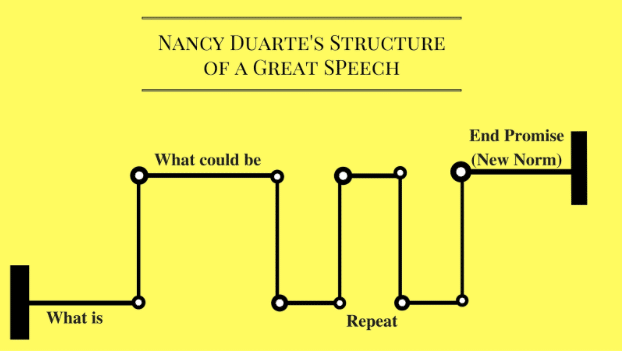 Another amazing public speaking tip from Nancy Duarte is framing your speech around solving problems. She argues that all great speeches start with a problem we all recognize—this instantly taps into a common pain that we can relate to and want solved. It is the problem of ‘what is’ or what is happening right now that is wrong. This captures people’s attention. Then the speaker promises a solution to this problem—which alleviates worry and provides relief to the audience. This is the ‘what could be.’ The best speeches go between problems and solutions, taking the audience on an emotional journey. What problems and solutions can you solve? Have you heard the writing advice, “Show, Don’t Tell”? The same applies for speakers. Speakers can tell audiences the problems and solutions, but showing the problems in real life and the solutions in action requires stories. Stories are incredibly powerful because our brains eat them up! Research has found that as you tell a story, the listener’s brain activates as if they themselves were in the story! Not only does this capture people’s attention, but it also makes your points more memorable. Let me tell you a story about the importance of stories. I love science and used to put as many studies and facts into my presentation as possible. My slide deck was filled with nifty charts and stunning graphs. At one speaking event, I showed up and their projector wasn’t working—I couldn’t show my slides. I basically had to wing it. I was so nervous and worried I almost canceled the event. I thought it was ridiculous to cancel an event just because my slides weren’t working, so I pulled it together and warned the organizers that it would probably be one of my worst presentations. Since I had no visuals to go off of, I had to explain the experiments as stories (without numbers) and rely on examples from real people I had taught instead of formal case studies. At the end of the speech, the audience rose to its feet and burst into applause. It was a small audience of about 25 people, but still I was floored! I got some of the best feedback from that speech that I ever had received. Why? I used stories to illustrate my points instead of dry facts and figures. Think of the three main problems in your speech. Now think of stories to demonstrate them. Think of the three main solutions in your speech. Now think of stories of people who used them. Technology can be an amazing tool for speakers. Tons of apps are available that can help you hone your craft. I reviewed 6 of my favorite apps you can use before your next event. A big mistake speakers make is failing to rehearse enough — and in the right way. 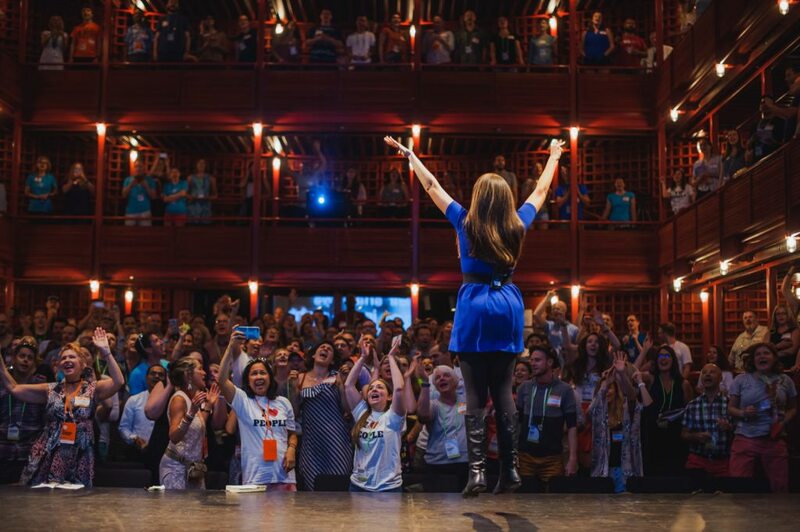 If you want to give a presentation that is compelling enough to inspire audiences to listen to your call to action, you need to give yourself plenty of time to prepare, so when you step on stage you know your presentation inside and out. You can take your rehearsal to the next level by practicing in phases. Phase #1: Read your content aloud to yourself or with a trusted friend. Make adjustments until the structure of your content flows, sounds natural and conveys your message. Phase #2: Practice your movements, body language and props. This is the step that most people forget to do; they have brilliant content but look awkward on stage because they’re too stiff, don’t know what to do with their hands or haven’t practiced with their props for presentations such as product demos. Phase #3: Hold at least one full dress rehearsal. Invite a couple of your friends or colleagues to watch you give your presentation wearing the outfit you plan to wear on the day of and practice as if it was your actual presentation. This tip comes straight from our Steal the Show summary — review all 7 tips. I am not going to tell you to put a bunch of jokes in your speech—although it would be great if you did. I know it is almost impossible to try coming up with jokes that don’t come naturally. So instead, I am going to ask you to consider a laughing mindset. We noticed that the best speakers, the ones who received standing ovations, had people smiling, and also mentally smiling, throughout a Talk, even when it was serious. What I mean by mentally smiling is the speaker set up inside jokes and a congeniality with the audience that felt like sitting with an old friend. Create an inside joke. Stand-up comedians do this really well. I went to hear one stand-up comedian and he started off with, “Oh brother, you know what happened to me today?” Then he told an amusing, but not laugh-out-loud, story. Then he did it again. “Oh brother, you know what happened to me yesterday?” and continued with another story. By the end of the routine, he could just say, “Oh brother,” and the audience would laugh. He created his own inside joke with the audience—both funny and powerful. Act it out. Sometimes a well-placed eyebrow raise or an exasperated sigh can loosen up the audience to the laughing mindset. Think of some of your stories that you came up with in point #3. Can you act out any aspects of your stories? Did your kid give you a hard time about something? Can you mimic them? Did you stumble into a bar late one night? Wink, wink. Nudge, nudge. Try to punctuate your words with expressions of your points. This pulls the audience toward you. Smile to inspire. When you smile you cue the audience to relax and smile. As you will see below, smiling also helps your perceptions of intelligence. Do you watch the TV show “Shark Tank”? We do! In fact, we did a research experiment analyzing all 495 pitches on “Shark Tank,” looking for patterns. If you plan to do a lot of pitching in your public speaking, then you must check out our 10 findings from our Shark Tank Study. I can’t wait for you to share your message using these tips! Remember to practice them until they become your own. And most importantly, always speak from the heart and always tell the truth. It should go without saying, but these tactics only work when you are being authentic and honest. I have no doubt that you can use your ideas to change the world, you just have to deliver them in a way so people hear them!